The World’s Biggest Belts by John Korn Jr.
“Space – the Final Frontier”. Those words, uttered by Captain James T. Kirk of the Starship Enterprise, may be the most familiar reference to man’s fascination with what lies beyond our atmosphere, but certainly that fascination goes back to the dawn of man. Since they had no internet or cable TV for night-time entertainment, early man saw things in the patterns in the sky. That power of imagination led to the realization that the patterns moved and eventually repeated. The list of astronomers and physicists that followed those early sky-watchers is too great to discuss. One particular physicist will be the topic of this paper. The field of space science research began when native Iowan James Van Allen developed experiments to study cosmic rays. On September 7, 1914, James Alfred Van Allen was born in Mount Pleasant, Iowa. He graduated from Mount Pleasant High School in 1931 and in 1935 received his Bachelor of Science degree from Iowa Wesleyan College in his hometown. Iowa Wesleyan had a top-notch physics professor named Thomas Poulter and with Poulter’s help, Van Allen tracked meteors, measured cosmic rays at the ground level, and conducted a magnetic survey of Mount Pleasant. Van Allen went on to study at the University of Iowa, earning his master’s degree in solid state physics and his PhD in nuclear physics. He then joined the staff at the Carnegie Institution in Washington, D.C., as part of the Department of Terrestrial Magnetism. This was where Van Allen became very interested in cosmic rays. However, World War II intervened and Van Allen’s work shifted to the development of photoelectric and radio proximity fuses for bombs, rockets and gun-fired projectiles. A proximity fuse causes a bomb to detonate at a fixed distance from its target, rather than upon physical impact. In 1942 Van Allen continued his work on proximity fuses at Johns Hopkins University. This activity included pioneering the development of rugged Geiger tube instrumentation for flight. He and his researchers shot shells into the sky and when they had fallen back to earth, dug them out of the ground with post-hole diggers to see if the vacuum-tube component had survived the firing. Eventually they came up with a workable proximity fuse. The development of this fuse was considered to be one of the great wartime technological advances made by the Navy. In addition, Van Allen invented the electronic circuit for the fuse (of which several million were manufactured), and, with four other scientists received the patent for the vacuum tube in the fuse. Later in 1942 he entered the Navy, serving as a gunnery officer in the South Pacific. He actually was tasked with testing the shells and proximity fuses under combat conditions. For this service he received four combat stars. He was discharged from the Navy in 1946 and returned to his research at Johns Hopkins in the Applied Physics Laboratory. It was at this time that he established the High Altitude Research Group to conduct high-altitude experiments using V-2 rockets captured from the Germans at the end of the War. This group also investigated ultra-violet solar spectroscopy, geomagnetism, and atmospheric ozone. Van Allen decided a small sounding rocket was needed for upper atmospheric research which led to the development of a new missile by the Navy. This new rocket was called the Aerobee. (A side note on terminology – a “sounding rocket” is a rocket used for carrying instruments to where measurements need to be taken. The term has nautical roots; “to sound” is to throw a weighted line from a ship into the water to measure the water’s depth). In 1947 Van Allen was elected chairman of the V-2 Upper Atmosphere Panel. In 1949, Van Allen and his colleagues developed the idea for the “Rockoon”. This inexpensive $750 contraption was a solid-fuel sounding rocket not ignited on the ground but carried into the upper atmosphere by a balloon. This allowed the relatively small rocket to reach much higher altitudes at a fraction of the cost of a V2 launch vehicle. A decade later Time Magazine reported in a cover story on him that “Van Allen’s Rockoons could not be fired in his home state for fear that the spent rockets would strike an Iowan or his house”. Van Allen had to convince the US Coast Guard to let him fire the Rockoons from an icebreaker bound for Greenland. The first Rockoon rose properly to 70,000 feet but the rocket did not fire. The second Rockoon did the same thing. Van Allen reasoned that the very cold temperatures at that altitude were to blame so for the third rocket he heated up cans of concentrated orange juice from the ship’s galley and bundled them around the Rockoon’s gondola. That rocket fired. An interesting event took place in 1950 that altered the interaction between man and space. An English physicist named Sydney Chapman visited Van Allen and remarked that he would like to meet other Washington area scientists. Van Allen contacted eight or ten of the top scientists in the area and arranged a meeting in the living room of his modest Bethesda, Maryland home. He later referred to it as “a pedigreed bull session”. Talk turned to geophysics and the two “International Polar Years” which took place in 1882 and 1932 in which the world’s leading nations studied the earth’s Arctic and Antarctic regions. The time was ripe for a world-wide geophysical year, what with the recent advances in rocket and instrumentation technologies. The group was enthusiastic about this idea and the idea spread around the world to other scientists. From this meeting the group, led by Lloyd Berkner, made a proposal to the International Council of Scientific Unions that an International Geophysical Year or IGY be planned for 1957-1958, during the maximum solar activity. This IGY, which ultimately involved scientists from sixty-six countries, was enough to stimulate the US Government to promise to develop earth satellites as research tools. The Soviets countered by developing and rushing their Sputnik satellite into orbit on October 4, 1957. Embarrassed by the surprisingly fast success of Sputnik, the Americans frantically finished their first satellite, Explorer 1 and launched it four months later. The Space Race was on! This all occurred as a result of that meeting and therefore, it can be said that the Space Race as we know it, began in James Van Allen’s living room. In retrospect, it is believed that had the U.S. Government acted sooner on Van Allen’s recommendation as to which branch of the armed services should launch Explorer 1 – Van Allen favored the Army rocket – this country would have been the first nation in space. Said Van Allen: “We could have put a satellite in orbit as early as September of 1956 – we had the know-how”. For five months in 1957, as part of the International Geophysical Year, Van Allen sailed from the Arctic to the Antarctic taking cosmic ray measurements with Rockoons. Today a satellite in orbit takes more data in a few minutes than Van Allen did in his five month voyage. Yet Van Allen’s vision for the low cost Rockoon as an alternative to the much more expensive Aerobee or V2 allowed him and his students to launch more than 700 Rockoons from 1952 to 1957. Off the coast of Greenland, Van Allen’s Rockoons recorded an intense concentration of cosmic rays at an altitude of thirty miles, a clue to the existence of the yet-to-be-discovered radiation belts. James Van Allen is best known for his discovery of the earth’s radiation belts which bear his name. This discovery was important enough to the scientific community to land him on the cover of Time Magazine on the May 4, 1959 issue. As the world prepared to send humans into space, it was a critically important discovery – sending men unknowingly into a relatively harsh environment of radiation would be a tragedy. Radiation also destroys electronic devices so understanding the belts was and is an important discipline with regard to satellites. The Van Allen Belts are two doughnut-shaped belts of radioactive particles from the sun, trapped by the earth’s magnetic field. The configuration of this doughnut shape is based on the magnetic poles of the earth. If you were to fly away from the earth from either pole you would not encounter the radiation and if you flew straight up from the equator you would encounter the thickest parts of the belts. Discovered in 1958 with instruments aboard the Explorer 1 spacecraft, the Van Allen Radiation Belts have long intrigued scientists. The inner belt, stretching from about 1,000 to 8,000 miles above Earth's surface, is fairly stable. However, the outer ring, spanning 12,000 to 25,000 miles, can swell up to 100 times its usual size during solar storms, engulfing communications and research satellites, bathing them in harmful radiation. Further complicating matters, the outer belt does not always respond in the same way to solar storms. Sometimes it swells; sometimes it shrinks - an event caused when electrons in the outer loop either drop into the atmosphere or escape into space. Under normal conditions the communications satellites in geosynchronous orbit at 26,199 miles are just out of the belt. Considering the important part satellites play in our lives today, a good understanding of the belts continues to warrant research. Last year, on August 30, 2012, a pair of satellites called the Radiation Belt Storm Probes were launched to continue research on the Van Allen Belts. They were soon renamed the Van Allen Probes. Your essayist cannot find evidence as to why they were not so-named in the first place. In September, scientists with the newly launched probes got permission to turn on one of their instruments after only three days in space instead of waiting for weeks, as planned. They wanted to turn on the Relativistic Electron Proton Telescope (REPT) so that its observations would overlap with another, similar mission, that was soon going to de-orbit and re-enter Earth’s atmosphere. They were soon very glad they did, because something happened that no one had ever seen before. A previously unknown third radiation belt formed in the Van Allen Radiation Belts. The scientists watched – in disbelief – while their data showed the extra belt forming, then suddenly disappear four weeks later, like it had been cut away with a knife. They have not yet seen a recurrence of a third belt. What happened is that shortly before REPT was turned on, solar activity on the Sun had sent energy toward Earth that caused the outer radiation belt to swell. The energetic particles then settled into a new configuration, showing an extra, third belt extending out into space. Observations of the belts over the years have shown they are dynamic and mysterious. However, this type of dynamic three-belt structure was never seen, or even considered, theoretically. At a press briefing, the team was asked why this third ring had never been observed before. “Knowing more about this and understanding more about the belts is important for having better models and being able to predict the lifetimes of spacecraft,” said Fox. The research continues. A smaller version of the instrument on the Van Allen Probes has won a coveted spot aboard an upcoming NASA-sponsored Cubesat mission - the perfect platform for this pint-size, solid-state telescope. Weighing just 3.3 pounds, the Compact Relativistic Electron and Proton Telescope (CREPT) will "augment the science of a major flagship mission" and demonstrate the effectiveness of two new technologies that make the instrument four times faster than its 30-pound sibling at gathering and processing data. The small solid-state telescope, which the team is developing under NASA's Low-Cost Access to Space (LCAS) program, will measure energetic electrons and protons in the Van Allen Belts. 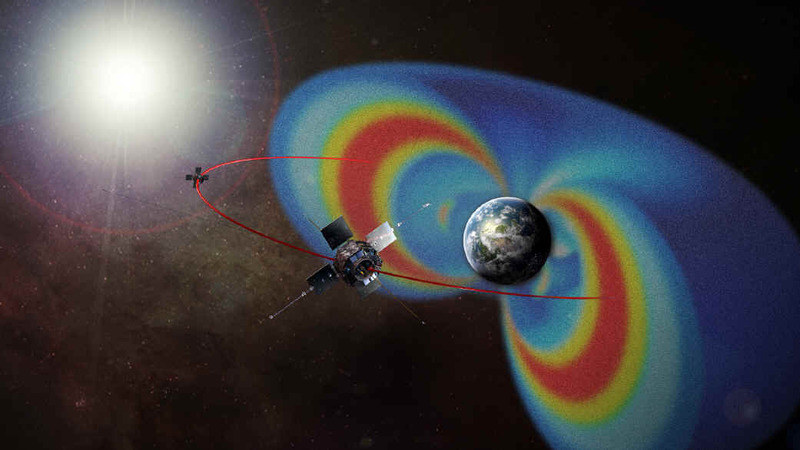 CREPT measurements will give scientists a better understanding of the physics of how the radiation belts lose electrons by a process known as electron microbursts. Under the $1.5-million LCAS award, this team will spend the next two years building CREPT. In year three, they plan to fly the telescope on a three-unit Cubesat. CREPT will be able to study electron growth and decay from a low-altitude polar orbit - an observing location that augments the science now being performed by REPT, which is flying in an equatorial orbit at high altitudes. Dr. Van Allen once said that finding the radiation belts around Earth was “the most exhilarating professional accomplishment I’ve been lucky enough to make.” He went on to say “next in order would probably be the encounter with Saturn. 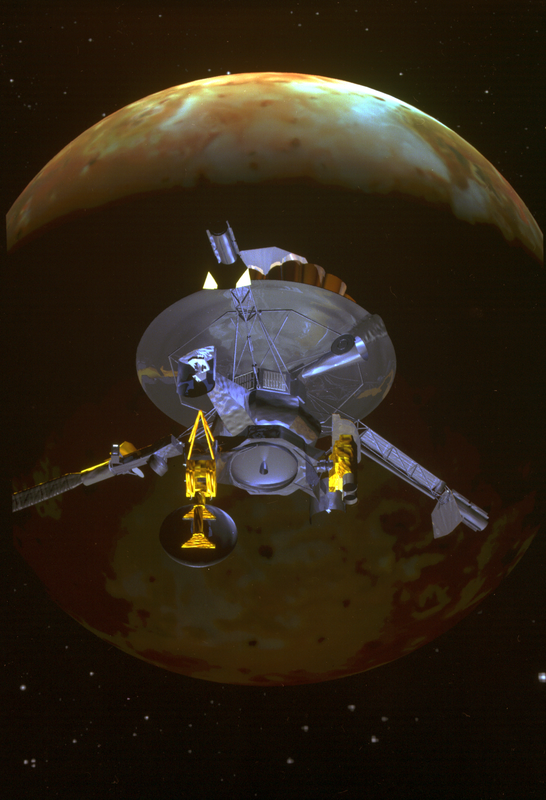 I had apparatus on Pioneer 11, which encountered Saturn in 1979. It was not known whether Saturn had radiation belts before we got there. Then we arrived (slide 4) and we found it did have belts – and we made a really good survey of them. In the meantime, we had encountered Jupiter. (slide 5) This was also an exciting occasion, but perhaps less so than the case of Saturn. With Jupiter, we had radio evidence of radiation belts before the arrival of Pioneer 10. Still, in terms of professional satisfaction, this ranks right up there with the other two discoveries”. My interest in Dr. Van Allen and the department he chaired for so many years comes from my good fortune to work there from 1979 to 1983. It was during this time that the building known as “The Physics Building” was renamed “Van Allen Hall” and as a member of the staff, I was invited to attend the dedication ceremony. The first three years I was a technician while enrolled in the College of Engineering; upon graduation in 1982 I was promoted to Engineer. The project I worked on was a Very Low Frequency Plasma Wave instrument, one of many instruments that went to Jupiter aboard the NASA spacecraft Galileo. Plasma in this case is charged particles which exist in space and their density varies in a repeatable fashion, hence the term “plasma wave”. Plasma in space is matter which has reached an elevated physical energy state. For example, water in its lowest energy state is a solid (ice). Apply energy to ice and you get the liquid form, the next energy state. Apply energy to water and you get steam, and if you could apply energy under the right conditions to steam, you would get a plasma. The aurora borealis or northern lights is an example of a plasma. The glowing plume of a burning candle is another example of a plasma. My final duty for Galileo was environmental testing for a month at the Jet Propulsion Laboratory in Pasadena, California. The Galileo mission nearly didn’t happen. It was scheduled to launch in 1986 on the next space shuttle mission after the shuttle Challenger exploded in January of that year. There were no more shuttle flights until late 1989 and by that time the planets were in a very different alignment. The NASA engineers had to send Galileo out and a few months later slingshot it around Earth to get it to Jupiter where, rather than make a fly-by like most satellites, it went into orbit and remained there for the lifetime of the mission. Teaching a basic astronomy course was not a one-time thing. Dr. Van Allen chose to do this regularly throughout his career. The hundreds of students who took this course were encouraged to interrupt him at any time with questions. “Every morning I wake to the realization that there is something I would like to understand but do not. A good day is one during which I manage to inch forward a little in understanding and comprehension. Dr. Van Allen was very much a family man – he met his wife in Washington when she backed her car into his front bumper. Minutes later he realized that they both worked at Johns Hopkins when he saw her enter the building. Although her degree from Mount Holyoke was in English Literature, her job at Johns Hopkins was as a mathematician. They later married and had 5 children, Cynthia, Margot, Sarah, Thomas, and Peter. Dr. Van Allen also had a brother who was a professor at the University of Iowa’s College of Medicine. Dr. Van Allen died on August 9, 2006 at age 91. His impact on space research continues around the world with projects like the Van Allen Probes and the upcoming CREPT spacecraft. Work at the Department of Physics and Astronomy at the University of Iowa has not slowed down. In addition to the 63 instruments and spacecraft designed and built at Iowa which are no longer operational or in existence, 13 are currently in use, still providing scientific data. This includes Voyager 1 and 2, launched in 1977. Two instruments are currently being built, slated for launch in 2014, and a third is planned for 2017. With the continual advances in electronics and shrinking budgets we can expect to see more and more science come from unmanned spacecraft. It’s fortunate that the trend with electronics is that they rapidly get better, smaller and cheaper because funding will certainly continue to wane. We will continue to gain knowledge about what makes up our universe and how it evolved, and we have James Van Allen to thank for the origins of this branch of science.